Hard Drive Sled for Mac Pro Desktops - FREE SHIPPING! 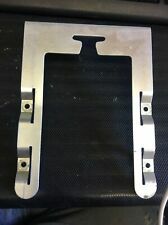 This is for a hard drive mounting bracket for an Apple 2006-2008 Mac Pro tower (1,1 2,1 3,1). You will receive a bracket with screws as shown in the pictures. This is for bracket number 2. These trays are used, but in good condition, minimal scratches. Includes all the screws. This is the complete set of 4 trays to install 4 3.5" drives. These are the longer trays required for the 2009-2012 Mac Pro. 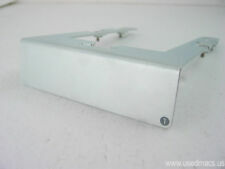 The item up for sale is USED "Lot of 4 2006-2008 Apple Mac Pro A1186 Hard Drive Caddy Tray w/ Screws 1,2,3,4 ". All caddies were pulled from Apple A1186 Mac Pros. All 4 caddies numbered #1-4 are included with screws. 1,2,3,4 HARD DRIVE SLED TRAYS FOR MAC PRO 1,1 / 2,1 / 3,1 WORKSTATIONS. We do not reset passwords. No screws no damping rubber. Suitable for any Tower cases APPLE MacPro, best for transforming your HD to SSD drives for any MacPro (1,1 ~ 5,1). HP ProLiant server grade parts, excellent quality for MacPro or other applications. NEW Condition HP2.5" SSD SATA Hard Drive Tray for 3.5" SATA mounting adapter. Trouble finding a genuine Apple hard drive sled for your Mac Pro?. Look no further, we have them! You may request any number sled #1-#4. We will do our best to accommodate your number preference. Apple Part # 922-8899. This is a complete tray set with all damping rubber and screws. Item is used and may have scuffs, scratches or signs of wear. Look at pictures for details. Item has been fully tested, inspected and is in good condition. Pulled from a working unit. No problem! 3.5” Drive Sled for Mac Pro (Compatible With Years 2009-2012). Choose whichever internal drive works best for you, whether a 3.5” SAS or SATA Hard Disk Drive, because Mac Pro Sled is compatible with them both. UP FOR SALE IS A Genuine Apple Mac Pro MA356LL/A HDD Hard Drive Caddy A1186 805-7032-A LOOK. CHECK PICTURES FOR MORE INFORMATION. CHECK PICTURES FOR REFERENCE. TESTED FOR KEY FUNCTIONS. As you can see from actual picture,( What you see Exactly what you get ). Hard Drive Caddy. Change of mind. Item Title. GENUINE APPLE HARD DRIVE CARRIER CADDY SLED 922-8899 - MAC PRO 2012 2010 2009 A1289 5,1 Condition: This item is in excellent USED condition. Set of 4 Hard Drive Caddy (#1, #2, #3, #4) w/ Mounting Screws for Apple Mac Pro 1,1/2,1/3,1 A1186 2006-2008. We are not responsible for item incompatibility. #1 Mac Pro Hard Drive Sled pulled from a 2009 Mac Pro. Minor markings near the #1. Apple Mac Pro Hard Drive Caddy Sled #3 Screws - A1186 2006-2008 (1,1/2,1/3,1). Condition is Seller refurbished. Shipped with USPS First Class Package. Came off a 2008 Mac Pro. Non sequential numbers. Mac Pro A1186 ,Mac Pro 1.1:MA356LL/A. Mac Pro (8-core),A1186,Mac Pro 2.1 Mac Pro (early 2008),A1186,Mac Pro 3.1:MA970LL/A. #3HDD Carrier Hard Disk Driver Tray with Screw for 2006-2008 Mac Machine. Models: Mac Pro 1.1 /2.1 / 3.1 (2006-2008). Lot of 4 2006-2008 Apple Mac Pro A1186 Hard Drive Caddy Trays 1,2,3,4. With Screws! Condition is Used. Shipped with USPS First Class Package. Great hard drive caddy for 2006/2007/2008 Mac Pro (Model A1186). Compatible With: 2006/2007/2008 Mac Pro (Model A1186). Easy to install and 4 screws are included. is what we are striving for. 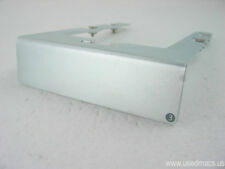 Original AppleHard Drive Sled P/N: 922-7728. for Mac Pro (2006 - 2008). taken from the Mac Pro 2,1 3,1. Suitable for any Tower cases APPLE MacPro, best for transforming your HD to SSD drives for any MacPro (1,1 ~ 5,1). 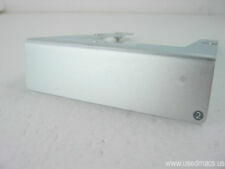 HP ProLiant server grade OEM parts, excellent quality for MacPro or other applications. Well, I will give you a few reasons:1. You ended up on this page because you are searching for aApple Caddies. These caddies will only work in the 2009-2012 Mac Pro computers. MANUFACTURER PART NUMBER: Caddies. Set of 4 New OEM Hard Drive Carrier Sled w/ Screws & Rubber Mount for Apple Mac Pro 1.1/2.1/3.1 A1186 2006-2008. We are not responsible for item incompatibility. They will NOT fit Mac Pro 4.1 and 5.1. LOT of 4 Apple Mac Pro Hard Drive Caddy Sled - A1186 2006-2008 (1,1/2,1/3,1). Includes all screws. Shipped with USPS Priority or First Class. #2 Mac Pro Hard Drive Sled pulled from a 2009 Mac Pro. Good condition with no major markings. Models: Mac Pro 1.1 (2006). Part #: HH805-7032, 922-7728. (Fits all Mac Pro towers from2009~2012 (A1289 ). (You will receive 2 of these adapters) - The Mac Pro SSD Hard Drive Adapter is a straight forward solution for all owners of MacPro towers. This is the BEST solution to mount a 2.5" HDD or SSD drive using your original tray). No Specific # Caddy is being sold. (Fits all Mac Pro towers from2008 & earlier (A1186 ). (You will receive 2 of these adapters) - The Mac Pro SSD Hard Drive Adapter is a straight forward solution for all owners of MacPro towers. This is the BEST solution to mount a 2.5" HDD or SSD drive using your original tray).